GREY WEATHERED WOOD When Floquil was purchased by Testors they stopped producing Driftwood Stain. This product was one that we thought was just great for getting a good basic weathered grey look to wood. Since that time we have tried many ways to achieve that color but the best and easiest so far has been to use Minwax water based stain called White Oak. This can be greyed out with the addition of small amounts of India ink and it can be diluted with water or alcohol. we try to vary the grey a little on each board so that it does not get too consistent and looks more natural. Pre-texturing the wood with a saw blade also helps . When the stain is dry the grain that has been raised is lightly sanded, often with a sponge sanding block. Finally , to bring out the scratched in texture a wash of diluted India ink is applied. This will require a little experimentation to find just what works for you. 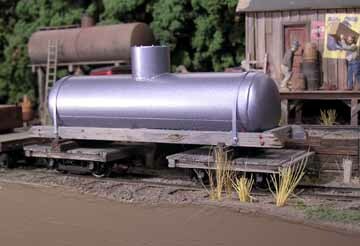 The wood frame of this tank was colored using the techniques above. CAST RESINS: wash the parts in luke warm water and detergent then rinse off all of the detergent . I then spray the parts with a flat finish like Model Master Light Earth or Dark Tan. Some times I immediately plunge the pieces into rotten stone for a few hours to get a little texture. Finally I paint the pieces with acrylic washes. To get a rusted look try Behlens alcohol based wood stains in warm brown colors. 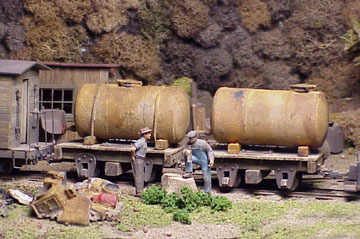 Alcohol based leather dyes are another good source of rusty colors that can be diluted with water or alcohol.Note the texture on these tanks. 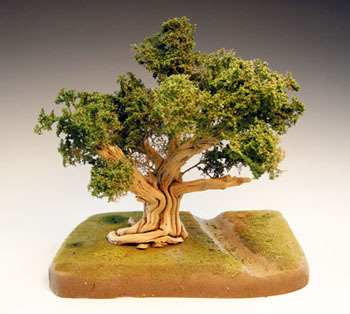 FOLIAGE: When creating an area of interest on your diorama or layout a special bit of foliage can be a focal point. If you have access to a garden, using dried herbs stems such as Rosemary or Globe Basil (miniature Greek or Italian cultivars) can make stunning tree trunks. Also tomato stems taken after a killing frost work well as dead old trunks. The Manchester Mini-Bunch once had one of these as a hangman's tree on one of their modules. The hanging effigy periodically had a name of a different modeler friend tagged on to it during train meets. FOLIAGE: While doing some winter pruning of butterfly bushes I decided to try using the dead floral heads for trees. 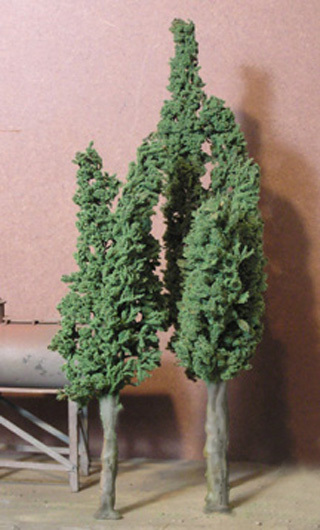 The heads were trimmed , sprayed green and immediately dipped in ground foam. 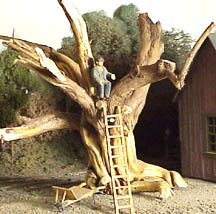 Some trees were made by wiring three flower heads together and coating the the trunks with Water Putty. This made a fuller tree. The beauty of using these plants as a model foliage is that Butterfly Bushes grow just about any where and are inexpensive. 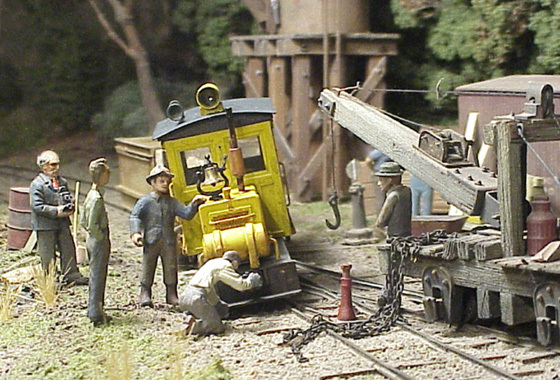 FIGURES: When adding figures or details to create a scene I like to have as little sheen to the surface as possible because shiny surfaces often do not reproduce well in scale photo graphs and can be quite a visual distraction. To get a flat finish I prep the figures or details then prime them with Krylon grey primer. When they are dry I use a water based paint by Jo Sonja. This is a dead flat acrylic gauche that is available in art supply stores. After the colors are applied I create shadows with very thin washes of artist oils thinned with synthetic turpentine . Siennas and umbers work nicely for this. Another tip that I have had great success with is to employ washes of color using windshield washer fluid for the medium rather than plan H2O. This works best with flat acrylics like Jo Sonja or the craft paints that are available at craft stores like Michael's . These washes tend to build up colors in cracks, crevasses, nooks and crannies. CHALKING Here is a quickly made little tool that is very convenient for gathering weathering chalk dust. It is a simple frame over which is stapled open coat dry wall sandpaper. This product is like a rough texture screen. One simply places a scrap of paper under the sandpaper and then sands the chalk on the sandpaper. 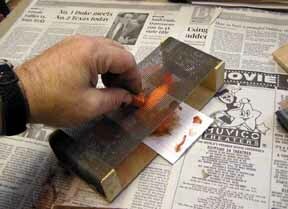 The dust falls onto the scrap paper ready for application with a brush or dauber. 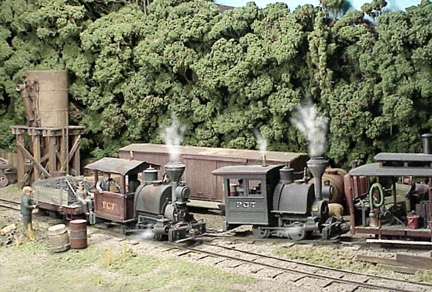 Notice how little paint sheen is on the figures, animals and details. We hope that these tips will help with your modeling and we will add more suggestions as time permits.